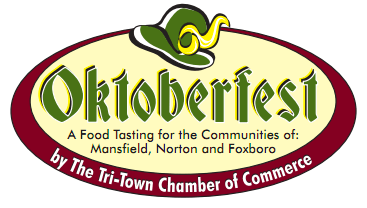 Tuesday, October 4th, when the Tri-Town Chamber of Commerce hosts its annual Oktoberfest. The popular Oktoberfest program brings together dozens of local restaurants and food service providers in one place to share savory samplings of their most requested menu items. Among last yearâ€™s offerings were appetizers and hors dâ€™oeuvres such as Steamed Mussels Tossed in Romesco sauce with toasted garlic and chorizo sausage, Chicken Paella with lemon scented rice, sweet red peppers, artichoke hearts and tomatoes and Lobster Bisque and Bourbon Chicken. In addition, two massage therapists from Back to Health Chiropractic of Mansfield will provide on-site chair massages, and local musicians will provide delightful background music. The 2011 Oktoberfest is about more than filling oneâ€™s plate with delicious dining options.Â Proceeds from the event benefit food pantries in the Tri-Townâ€™s communities of Foxboro,Â Mansfield and Norton, including Discretionary Fund, Foxboro, Our Daily Bread, Mansfield,Â and Cupboard of Kindness, Norton. In the past, Oktoberfest has provided substantial financialÂ support to these organizations and organizers hope to be able to do so again. Tri-Town Chamber of Commerce at 508-339-5655 or email edirector@tri-townchamber.org.